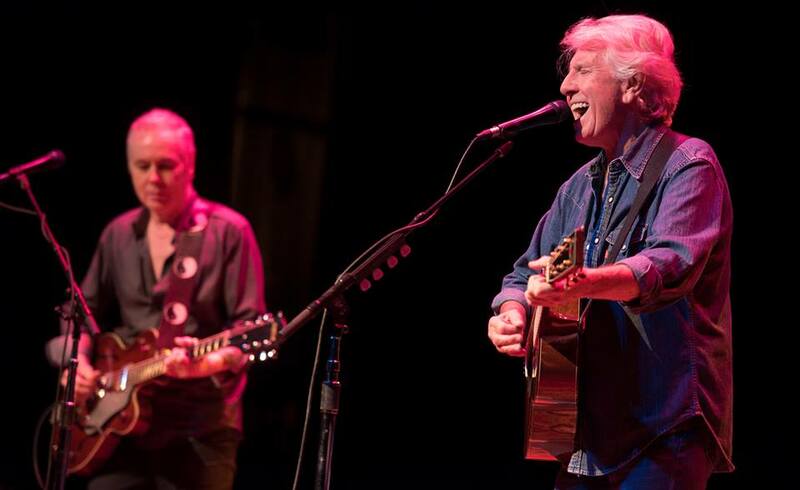 Photo of Shane Fontayne (left) and Graham Nash from Nash’s Facebook page. While it was obvious he would save “Chicago” for almost last, the rest of the concert was not as predictable. Nash was once again joined by Shane Fontayne, a versatile guitarist-vocalist who’s also toured with Sting and Bruce Springsteen, but unlike his other recent shows in our area, there was a third party on stage. Keyboards player-vocalist Todd Caldwell is also a familiar companion for Nash, having toured with Crosby, Stills and Nash in the past. Fontayne also added extra power to “Wind On The Water,” “Cathedral,” and “I Used To Be A King.” The quieter moments came on “Golden Days” from Nash’s 2016 solo effort This Path Tonight, “Simple Man,” and “Sleep Song.” Nash mentioned the recent Joni 75 all-star birthday concert (and upcoming film) for Joni Mitchell while introducing his exquisite love song to her, “Our House.” There was only one Hollies song this time out, a well-crafted take on “Bus Stop.” I’d still love to see Nash come to terms with the Hollies portion of his career, perhaps devoting an entire concert or album to reworked versions of his best material with them. As for “Chicago,” it served as a rousing first encore, bringing the crowd to its feet to sing along on, “We can change the world.” After a gorgeous rendition of Buddy Holly’s “Everyday,” Nash had everyone joining in again on “Teach Your Children,” which he dedicated to the high school activists campaigning to end gun violence.